Last month there were reports of interesting bird behaviour. Birds were seen spread-eagled on the ground, sometimes quite approachable and, in the words of one observer, the birds seemed to be in “ecstasy”. In one case the observer watched in amazement as a carrion crow tore at grass and moss in the garden and then lay with wings outspread over the mess that had just been made. The crow was almost certainly “anting”. Crows do it quite a lot, as do other species. They disturb ants’ nests and then spread themselves out encouraging the ants to run over their feathers. It is thought that this is some form of feather care. The ants help rid the birds of pests like feather mites and louse flies, perhaps by squirting their formic acid around. On the other hand on a sultry summer's afternoon, after the breeding season is over, when there is plenty of food to be found and the living is easy – maybe then crows just seek out experiences that give them a little tingle. 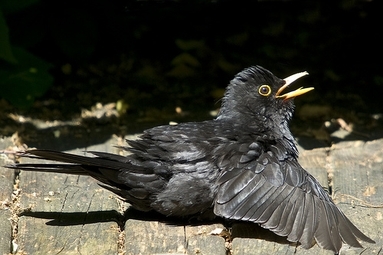 Spread-eagled birds are sometimes indulging in “sunning” – even on Arran. This can be anything from simply standing with their backs to the sun with their feathers rustled up to expose the skin below, to a full spread eagled sunbathing posture with wings and tail feathers spread out to maximise the area open to the sun. Like “anting” the benefits to the bird are a matter of supposition. The birds get warmth from the sun. Some scientists have theorised that the sun's warmth is important in helping dislodge feather parasites, or that the ultra-violet in sunlight helps turn some precursor molecule in the preening oil into vitamin D and that the birds need this vitamin. On the other hand it may just feel good.